All the pancakes in my blog as far has been wholewheat pancakes, I think I'm in love with wholewheat ones...though I have tried making using all purpose flour/maida but I end up using whole wheat. Anyways so here is simple and quick blueberry pancake, I got this lovely, fresh blueberry pack from the organic session of fair price to make something else and but made with this pancakes for a filling breakfast (actually it was a brunch). ~ Add egg if you want. 1. Wash and keep the blueberries aside. If using frozen then thaw it. ~ I used 1 cup milk and 1/2 cup water. 3. Heat a pan or skillet apply oil or butter whatever you want to use, pour 1 ladle of batter and let it batter spread by itself. 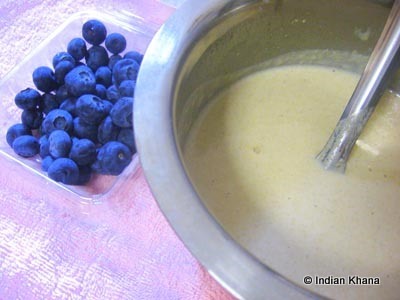 Drop 5-6 blueberries on each pancake and cook until bubble appears or edges becomes brown around 2-3 minutes in medium flame. 4. Flip over the pancakes and cook another 2-3 minutes or until golden brown. Repeat the process for remaining batter. Pancakes look perfect Priti .. 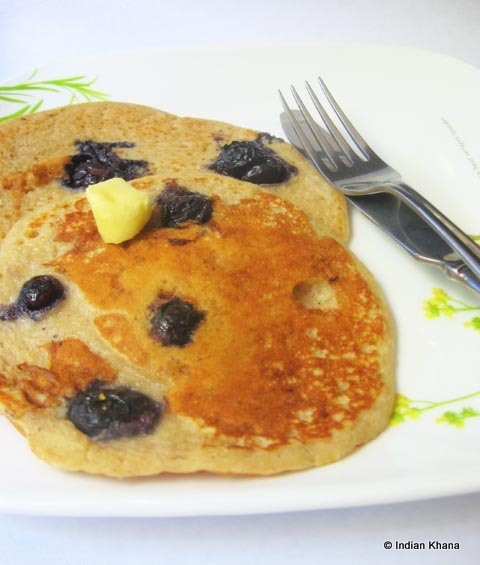 Perfect breakfast.Healthy and yummy pancakes.Can i use dried and sugared blueberries..? Pancake looks yummy and delicious. 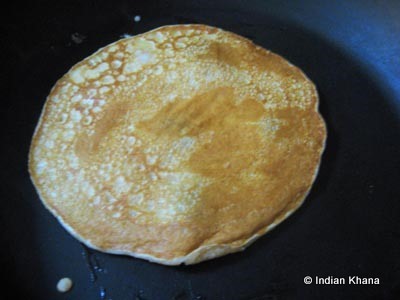 @SS ...sure you can use dried n sugared berries...just check if you need to reduce the sugar or jaggery in batter...but I think you don't really have to reduce the sweet level a lot ...it should be gud ..
Also if you want just add the berries directly in batter ..try tht for few pancakes ...all the best :)..let me know the result ? Whooo, looks delicious...very tempting pictures...makes me hungry. Nice idea,look so so yumm,never tried this way..Great way to start a day! I love pancakes and this looks so so good. And with bluberris who can say no to that. Looks yummy and delicious. Love blueberries. I loveee pancakes and blueberries and these are so good. 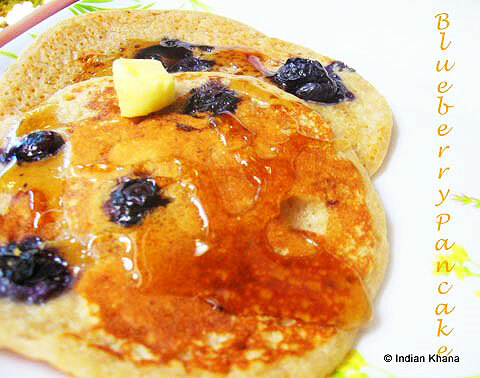 Pancakes and blueburries.. What a great combination! They look devine. 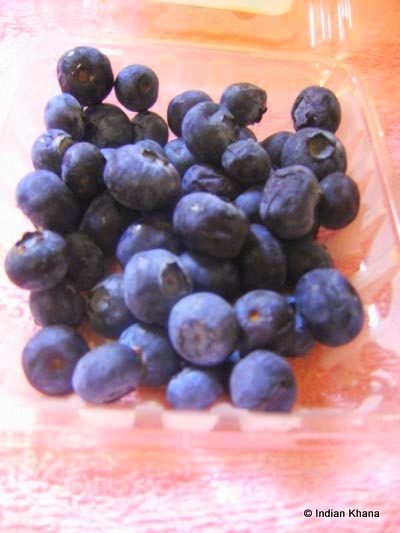 Priti i have to travel to far of restaurant for blueberries..is there any substitute of it? Look for my other pancake recipe .. I would love to have these delicious pancakes for breakfast. Yumm! perfect wholesome breakfast .. yummy! Awesome and healthy PAncake.. great way to start the day. Love the healthy whole wheat pancake. Awesome, delicious and healthy pancakes.. what a great way to start the day!